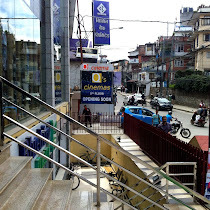 The first question I was asking myself when I entered the theater to watch Kabaddi Kabaddi was "Will the love story of Kaji (Dayahang Rai) and Maiya (Rishma Gurung) be successful?". Kaji's love for Maiya is same as it was before and Maiya hasn't changed either. In order to challenge Kaji, Bom Kaji (Saugat Malla) enters the Naurikot Village who was actually supposed to help/support his father for the election. Betrayed in Love from city girls, Bom Kaji's another goal also happens to be getting married with a village girl and taking her to Kathmandu. In the meantime, Bom Kaji falls for Maiya and there is a clash between Kaji and Bom Kaji. The movie revolves around this and finally it's decided who Maiya falls for. Naurikot village is beautiful as is and its election time in the village where Maiya's Dad (Shishir Bangdel) and Bom Kaji's Dad are the leading contenders of two different political parties. Maiya's Dad uses the power of his money whereas Bom Kaji's dad uses his goodwill and reputation to win the election. Kaji initially supporting Bom kaji's dad later supports Maiya's Dad because Maiya's dad promises Kaji to hand over his daughter to Kaji, if he wins the election. Nischal Basnet appears as Bom kaji's friend who betrays Bom Kaji by breaking his love relationship with Priyanka karki and finally marrying with her. "Kabaddi kabaddi" has also included additional story of Kaji's two other friends: Bijay Baral and Buddhi Tamang (Popular with The "Hait" dialogue). Both of them can be seen in an aggresive role. Overall the movie is a real entertainer with a lot of comedy moments. All the characters in the movie have done a very good job. Dayahang Rai's acting is flawless as always. kabaddi kabaddi has already been able to collect 1.3 crore in just two days of its release and this movie is no doubt a must watch nepali movie 0f 2015.